If we do not speak with you before now and the new year, we would like to wish you a very Merry and Safe Christmas and all the very best for the New Year 2019. We will be closing the office on the 21st December 2018 for a much-needed break and we will be back all recharged from the 7th January 2019. Over the festive time, if you need anything from us, Carlos will be available on his mobile 0413 560 808. Request FREE Rental Appraisal here! "Your Local Property Management & Sales Specialists"
Previous Board Member of Singapore & Malaysian Business Associations, BA Modern Asian Studies (GU) majoring in Economics & Mandarin, Licensed Real Estate Agent since 1996. Member of REIQ. Firm Member of Leading Property Managers of Australia. 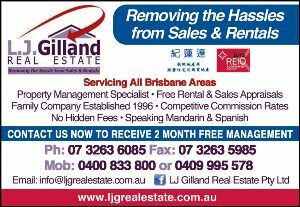 Our expertise at LJ Gilland Real Estate is your peace of mind. Our reputation lies in high performance property sales, and we take great pride in our excellence in property and asset management as well as body corporate management. We find individual solutions to fit our Clients needs. Being property specific rather than area specific because confining ourselves to one area simply wouldn't be giving you what you need. Specialties International Business negotiations, bilingual, Appraising Queensland Based Properties, Contractual negotiations, Dedicated to Family & Business, hardworking & focused to get the best outcomes for each and every Client.